The Jim Thompson Farm is open daily from, beginning of Decmeber to beginning of January , from 9.00 am until 5.00 pm. 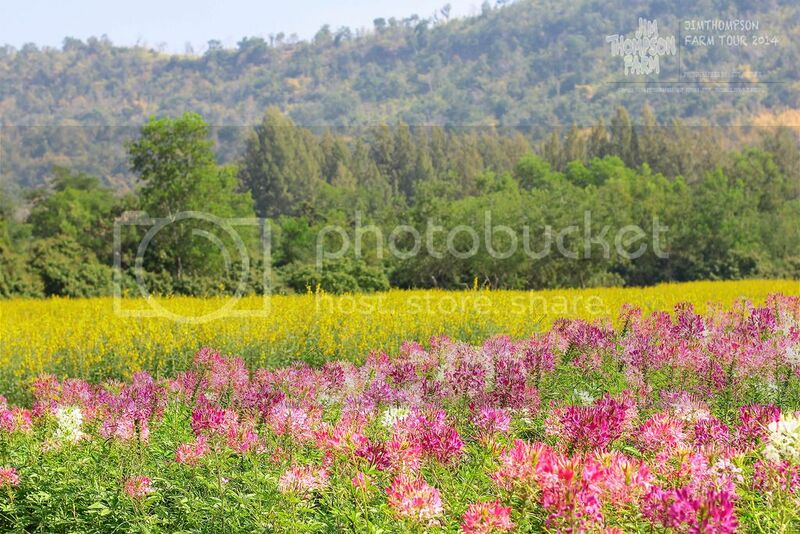 The Jim Thompson Farm is ideally located, lying between the large Lam Samlai Reservoir and the steep, bamboo-infested Phrayaprab Hills. The farm covers an area of 721 rai or 280 acres. It was established in 1988 primarily to raise mulberry for the production of silkworm eggs and silk cocoons (sericulture). Subsequent improvements in mulberry productivity made possible by advanced agricultural techniques (drip-irrigation) and other farm efficiencies, have allowed greater use of the land for a multitude of other agricultural purposes and, finally, tourist activities. The Jim Thompson Thai Silk Company has long been committed to promoting Thai raw silk production in the village of northeastern Thailand (Isan). Mr. Jim Thompson first visited Pak Thong Chai in the 1950’s, where he found a thriving village of silk weavers many of whom become “pioneer” suppliers selling their hand woven silks to the Thai Silk Company (Jim Thompson). In 1988, to ensure a steady and reliable supply of raw materials for silk production, the Thai Silk Company decided to invest in its own mulberry plantation and silkworm egg production center. 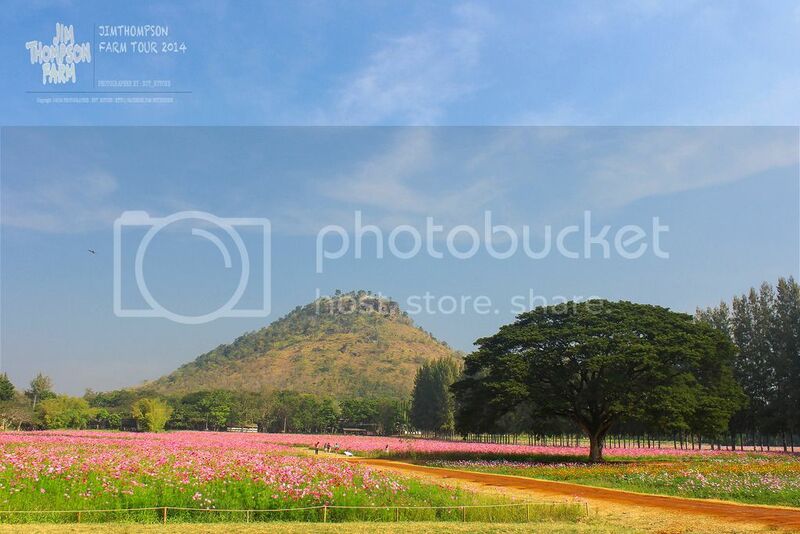 Situated in the Pak Thong Chai district of Nakhon Ratchasima province, the project area initially covered 600 rai (about 96 hectares/237 acres). 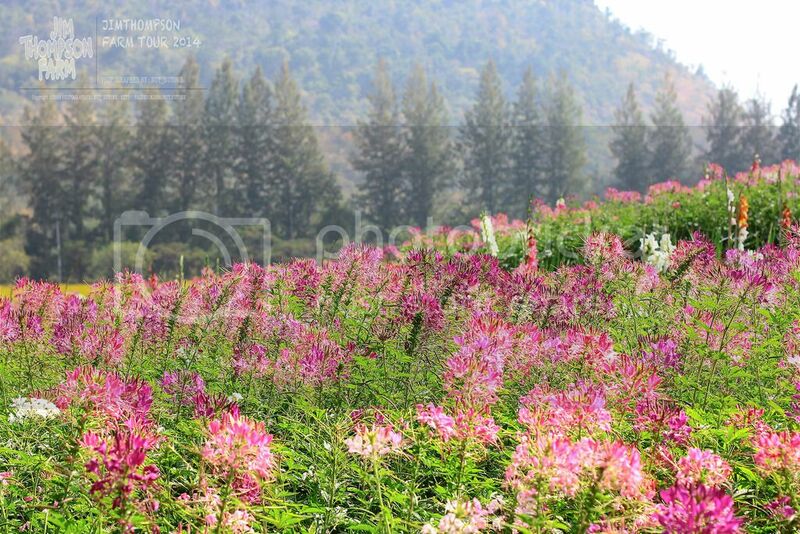 This silk farming, or sericulture, which focuses primarily on the rearing of hybrid silkworms and the cultivation of top grade silkworm eggs to be sold to contract farmers, came to be known as the Jim Thompson Farm. 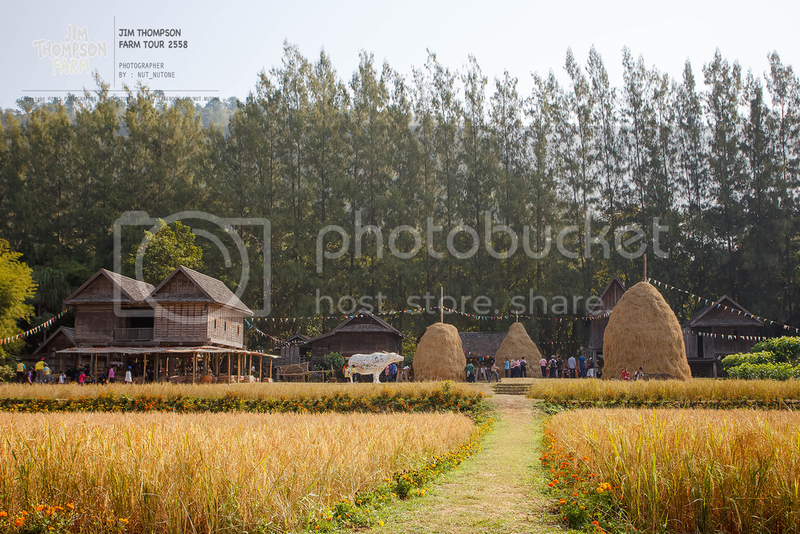 The Jim Thompson Farm was opened to the public for the first time in 2001 and has since evolved into one of Isan’s most popular agrotourism and ecotourism attractions. It is open to visitors only once a year during the peak of the cool season. 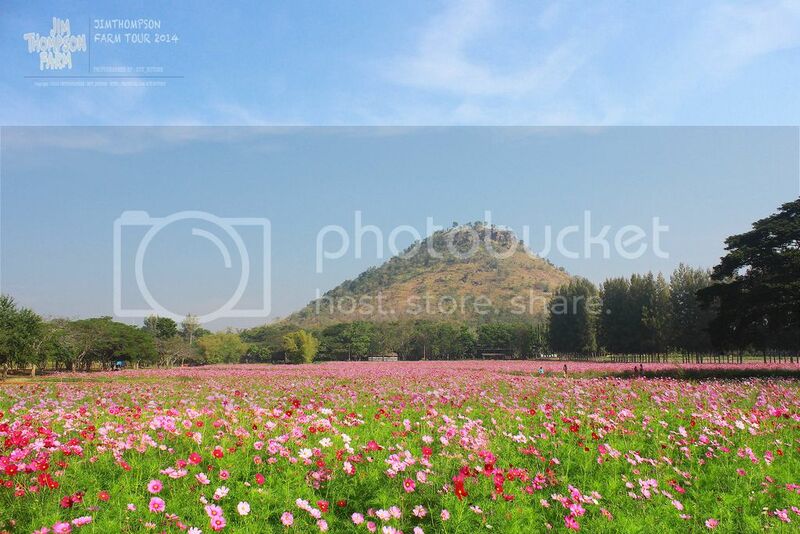 This is the best time of the year to enjoy the picturesque rural landscape. 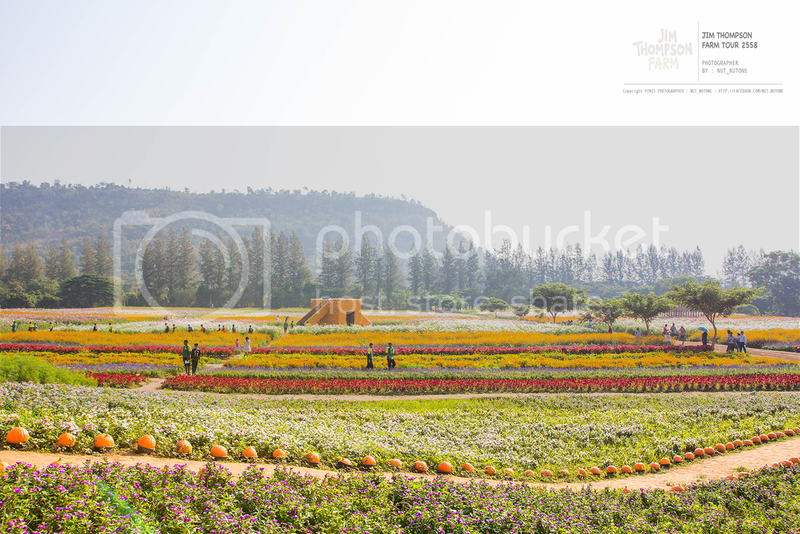 Set against a scenic backdrop of gently rolling hills covered with impenetrable thickets of bamboo, the farm features large tracts of mulberry plantations, orchards, nurseries and gardens full of colorful flowering and ornamental plants, as well as hydroponic vegetable production. The Jim Thompson farm tours provides a unique opportunity for visitors to observe up close and personal the full life cycle of the silkworms and the silk farming process as part of the Isan way of life. Other highlights include a tour of the vegetable plots and ornamental plant nursery. A great variety of delicious fresh fruits and organically-grown vegetables come into season at this time of year. In addition to cut flowers and ornamental plants, a selection of fresh, high quality, organic vegetables and fruits and wholesome farm-made snack foods are also available on sale at the farm. The Company has an active program of propagating hybrid silkworm eggs of a high standard and quality for distribution to the thousands of villages throughout the Northeastern (Isan). The silkworm eggs are packaged in the batches of 18,000 eggs and carefully transported to distribution centers where the villagers take delivery. In a matter of days the eggs hatch and the rearing cycle begins. After a few weeks the villagers can opt to sell the fresh cocoons or reel the cocoons into skeins to sell to Jim Thompson. Both the traditional golden yellow Thai silk cocoons and the Chinese hybrid white cocoons can be reared by the villagers depending on their skills and the village environment. The Jim Thompson farm entrance is certainly unique with hundreds of wooden buffalo cartwheels from days gone by lining the road and fencing-in the vast mulberry fields. 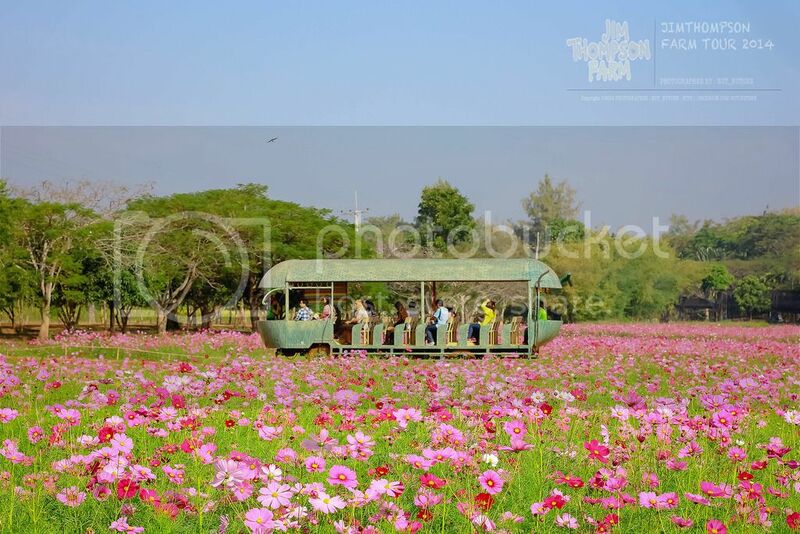 At the main entrance, farm tour tickets can be purchased (Weekday: Adults Baht 120 and Children Baht 80, Weekend: Adults Baht 140 and Children Baht 100). Several vehicle parking lots are located near to the farm entrance. Also located in this area are bathroom facilities and a wheelchair access bathroom. Adjacent to the entrance is the Farmer’s Market where a large selection of fresh pesticide-free fruits and vegetables and a variety of farm-made snack foods are on sale. In great demand are the delicious melons and cantaloupes. The farm is also famous for raising pumpkins in all shapes and sizes, and all are on sale here. There is also an interesting assortment of selected merchandise and traditional hand woven textiles from the Jim Thompson factory available for purchase. Northeastern food is given top billing on the Jim Thompson farm. You will find a full array of Isan food vendors selling a wide variety of tempting northeastern dishes, especially chosen to please and fire-up your taste buds. In an open-air casual setting with lovely views of the mulberry plantation and surrounding greenery, visitors can enjoy a tasty Isan meal. 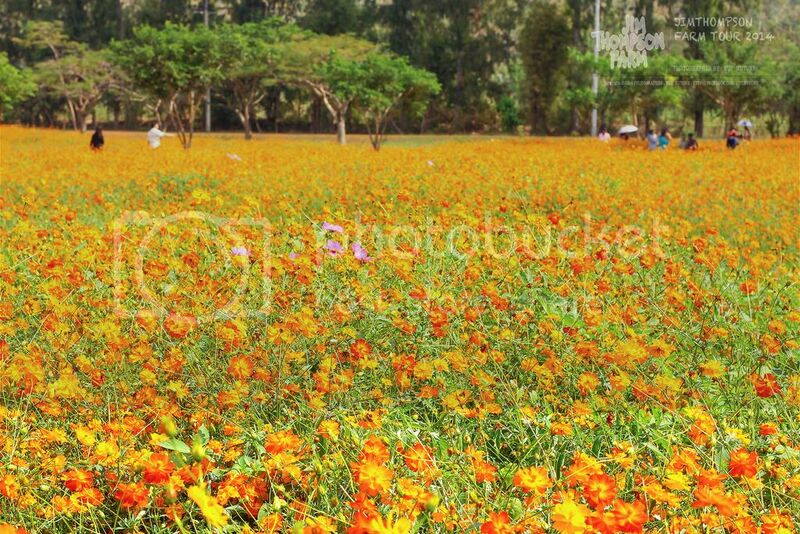 Mushroom cultivation, hydroponic flower gardens, silkworm rearing, decorative plant nurseries and large fields of colorful flowers and sunflowers waving in the bright sunshine are just a few of the events to be enjoyed. The giant pumpkin patch still remains the favorite family attraction. The variety in shapes and sizes of the multitude of pumpkins on display in the fields and already harvested are truly impressive and provide endless opportunities for memorable family photographs. New agricultural attractions include: organic farming of fruits and vegetables and rice fields where assorted Isan rice varieties have been planted and will be ready to harvest during the farm tour period. Our visitors will have the opportunity to mill their own rice using antique hand-operated wooden rice grinders. Afterwards, they can winnow the rice themselves and then take home their own “rice crop”. Our formidable, sturdy water buffalo, “Boonlai”, will be standing by available for photographs. The Isan and Khorat villages are star attractions featuring antique houses unique in architecture and in pristine condition. 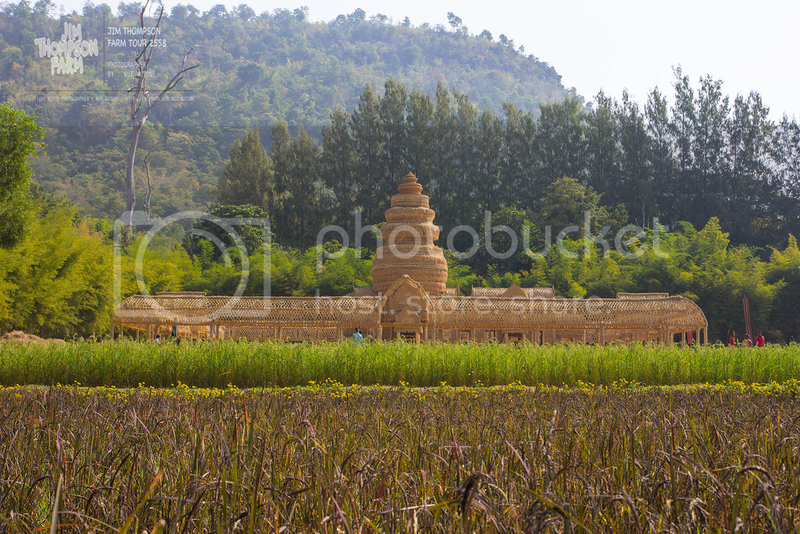 These traditional Isan and Korat houses and various structures commonly found in rural areas are fast disappearing. The village project is an effort to conserve, as well as preserve, the fast disappearing architecture, crafts and style of living in northeastern Thailand. In doing so, Jim Thompson seeks to preserve the rich cultural heritage of the Thai-Lao peoples who inhabit northeastern Thailand. Various village activities will take place around and in the Isan and Korat houses such as traditional ceremonies and native dances, A better appreciation and understanding of Isan culture by both foreigh and Thai visitors will certainly result. The Isan village has increased considerably from an initial three small structures first erected in 2008 to one now steadily expanding year by year. The village has achieved a success and reputation that was unimaginable by all those originally involved in the beginning of the project. In the past few years we have completed many Isan village houses, two rice barns, a guardian spirit house and a most impressive Haw Jaek or village sala. 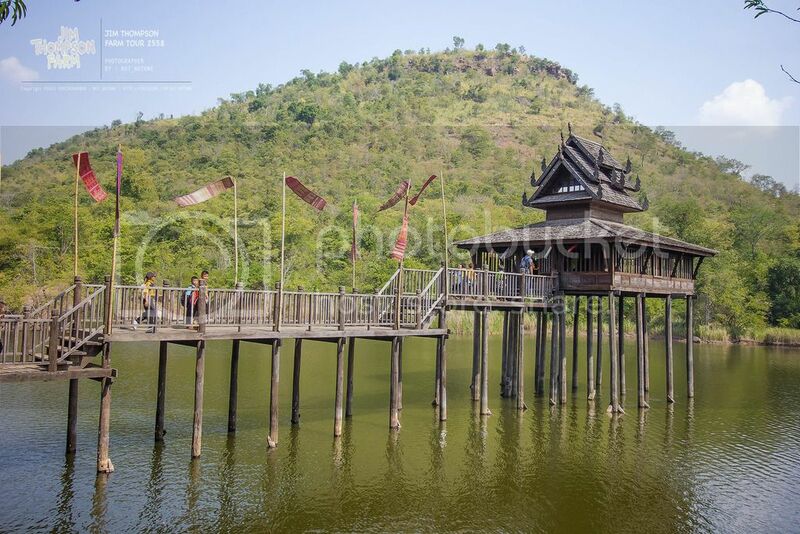 Striving to respect the integrity and authenticity of the original design of these Isan structures is paramount whether only simple or extensive repairs are required or in those cases when building anew such as the Haw Jaek and Sim Nahm. Such wooden structures in Isan are fast disappearing or have been compromised by unsightly modifications bearing no resemblance to their traditional form. Having successfully completed the Isan and Korat village centers, Jim Thompson hopes that this area will become a repository of learning and accumulated knowledge of traditional and fast disappearing Isan architecture reflecting local wisdom of days gone by. To further this objective, we have expanded the village area to encompass a total of fifty rai / twenty acres and have continued to expand our collection of Isan houses reflecting many different traditional styles. The Sim Nahm was designed and its construction closely supervised by Professor Phahonchai Premjai, the Jim Thompson Farm architect and advisor, who is a noted authority on traditional Isan (northeastern Thai) architecture. There are many architectural styles of Sim Nahm in Isan; the majority of these are Sim constructed of wood built on the ground within temple precincts. 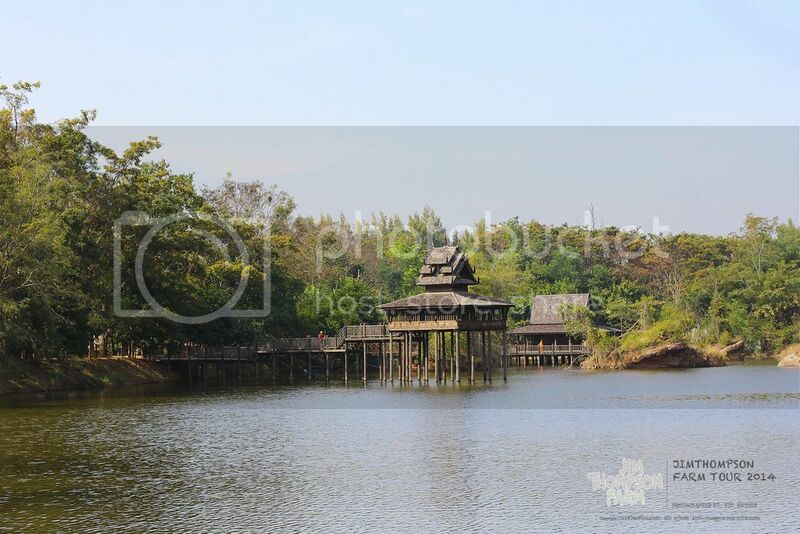 Sim Nahm that are constructed on wooden pillars in a temple pond or temple reservoir are highly unusual. Most regrettably, whether built on land or over water, very few Sim Nahm remain standing due to the rapid deterioration of all wooden structures in the harsh climate of Isan. In most cases, they are sadly neglected and left to disintegrate without proper care or repair. The few remaining Sim Nahm in Isan were carefully researched by Professor Premjai who is a native of Chaiyaphum and his team of experts all of whom are noted scholars of traditional Isan architecture. The Jim Thompson Sim Nahm is a thoughtful combination of several Sim styles distilled and refined. The design of the building respects and incorporates age-old Isan Sim Nahm design resulting in a Sim that is faithful to traditional Buddhist temple architecture. The Sim Nahm is situated in a large pond originally used for irrigating our mulberry fields. During the farm tour period, venerable Buddhist images were installed to allow our visitors to pay homage and receive blessings. The Sim Nahm is a tranquil, spiritually enriching repository of Buddha images long associated with the practice of Buddhism in Isan society. The Haw Tri or Buddhist Library is one of the many types of structures found within the confines of a Buddhist temple compound. 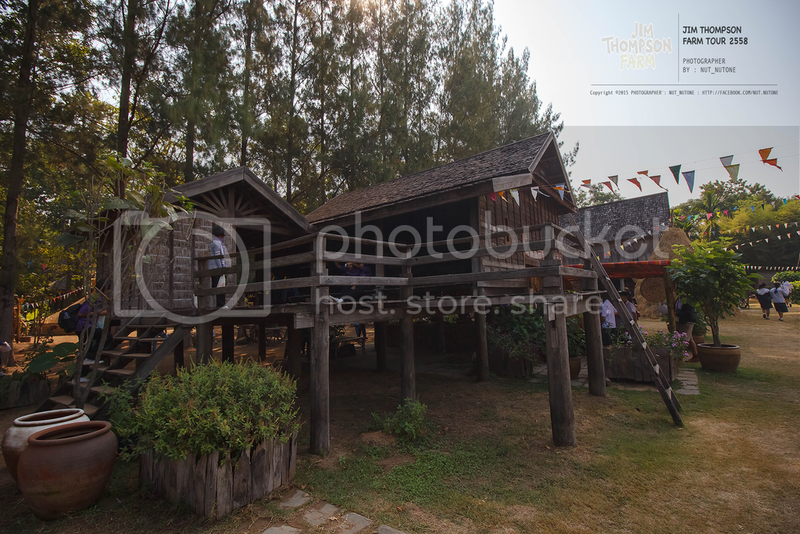 The Haw Tri is a temple library built on land or over a pond for storing the sacred Buddhist texts where monks and novices can go to read and study the texts. The Haw Tri is also a workroom where repairs can be made to the fragile palm leaf pages and where copies of faded or dilapidated texts or pages can be made for the temple library safekeeping or for distribution to other temples. The Buddhist scriptures and other religious texts are first inscribed into long lengths of specially prepared dried palm leaves and then dusted with fine black soot to the text readable.